Data driven Alerts are not sending mails to the users for data threshold,But sending mails to Admins. Hi Data driven alerts are not working for users but it is working for admins. Users have proper access to the content,have proper mail id. In configuration SMTP, we have mentioned admin mail id's. Please help on this one. 1. Re: Data driven Alerts are not sending mails to the users for data threshold,But sending mails to Admins. 2. Re: Data driven Alerts are not sending mails to the users for data threshold,But sending mails to Admins. 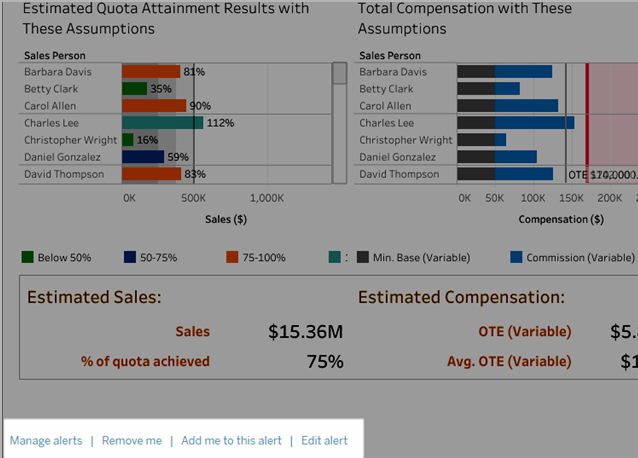 You can manage alerts from the My Content area of Tableau web pages, but doing so directly from alert emails can be quicker. Click the links below the image to manage all your alerts, or add or remove yourself from the emailed alert. If you're the alert owner, click Edit this alert to change alert settings such as threshold, schedule, and recipients. Tip: To add recipients to an alert you don't own, forward the email and ask people to click Add me to this alert. Temporary connectivity issues. In this case, the alert will fix itself. The workbook or sheet that the alert was created on has been removed. Open the workbook in Tableau Online or Tableau Server. A warning will appear if credentials to your data have expired or if the data for your workbook has been removed. Click Edit this alert to change alert settings such as threshold, schedule, and recipients. A warning will appear to tell you if the workbook or sheet that your alert was created on has been removed. You'll receive an email notification when the alert is working again.